Last week I was naughty and sent my husband to work with store-bought frosted sugar cookies. Sometimes these things can’t be helped. With only three days to scrub and paint the walls milk chocolate brown before Jesse arrived home, cookies were last on my to-do list. I’m not sure City Hall has forgiven me yet, but hopefully today’s cookie will make them forget about this little faux pas. These cookies aren’t named so because they utilize buttermints as an ingredient, but because they taste like them. 2. In a stand mixer beat together butter, granulated sugar, brown sugar and salt. Mix in eggs, green food coloring, vanilla and peppermint extracts. Mix in baking powder and baking soda. Mix in flour until just combined. Add 2/3 of a bag of mint chips reserving the rest for topping. Cover and refrigerate dough for 1 to 2 hours, or until chilled but not solid. 3. With a cookie scoop, scoop the dough 2” apart onto parchment. Press three chips into each cookie and bake for 9 to 10 minutes until edges are golden. Let set for 2 minutes and move to a cooling rack. 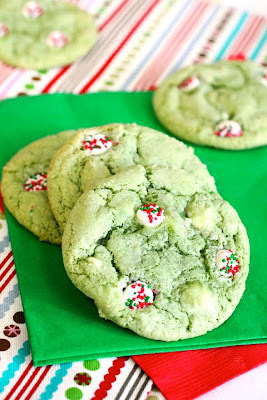 What a fabulous cookie idea for the holidays! I have always loved buttermints. And no worries about store bought cookies...sometimes you have to do what you have to do. And if it is a matter if staying up all night to bake or running to the store..store wins. This is perfect to use up the peppermint extract I just bought! And they are so lusciously green! These sound great and look so pretty! Did you sprinkle the chips and is that how they come? Yum! They looks so yummy and festive! These are delightful. No doubt delicious too. Wow. I'm afraid to make these for fear of eating all the dough before they ever hit the pan. Talk about impatience. Happy Holidays. The chips come that way. Isn't it funny how people begin to expect home baked goods from you all the time? I know I feel super guilty whenever I have to pick up a store-bought cake or package of cookies. But there are some weeks where baking just can't happen! These cookies are one treat that I am hoping to bake very soon. They look delicious! Thank you for sharing with me. I hope you have a blessed Sunday! A cookie that tastes like buttermints?! I am awe-struck. Those look so cute and festive too. Thank you for your sweet comment, I absolutely love your blog. Your pictures and recipes just make me smile (and very hungry) every time I read your posts! Wow! Those are some green cookies! They look wonderfully festive and sound divine! Yum! I love all mint cookies. your looks so good. Natasha that's awesome!!! Thanks for telling me. I bet they looked pretty cool in neon too. Hi. Where did you purchase the Guittard Smooth Melty Petite Mint Chips with the cute festive sprinkles?